The launch of the 100x daily Bitcoin / USD futures contract, XBT24H, corresponded with a surge in intraday price volatility this weekend. The result was a massive surge in trading volumes on BitMEX. This weekend, we hit a high of 29,000 Bitcoin traded over a 24 hour period. We want to thank all of our traders for helping to make BitMEX one of the most liquid exchanges to trade Bitcoin / USD. If you have not tried out XBT24H, you can take it for a spin on the BitMEX Testnet before trading with real Bitcoin. We are working diligently to improve the trading experience. We received many great suggestions for new features and UI design change requests. Look out for further announcements about upgrades to the platform. Whether or not the recent pump to 1835 CNY and subsequent dump to 1700 CNY is attributable to the MMM ponzi scheme, the premium of XBTCNY to XBTUSD continues to slowly rise. The PBOC resumed the CNY devaluation last Friday, and continued today. Each day at 9:15am Beijing time (GMT + 8), the PBOC releases the CNY Interbank Rate. The Interbank Rate is the rate at which banks can buy and sell CNY against the PBOC. The USDCNY and USDCNH (offshore CNY) follow the trend of the official interbank rate. The PBOC has allowed the CNY to strengthen vs. the USD and more importantly their trade rivals Germany (EUR), Japan (JPY), and South Korea (KRW) for years. Now with global growth slowing, and the aggressive money printing from Japan and Europe, China’s hand has been forced. Xi Jinping’s biggest economic goal is to shift China away from an investment led economy to a services and consumption lead one. Many politically important groups will be impoverished by the shift in economic focus. A way to cushion the blow to the manufacturing sector is to weaken the CNY. While the CNY was strengthening, the most popular carry trade was to borrow USD, FX into CNY, then buy bonds yielding significantly more than the cost of USD funds. Because the PBOC had a one way policy of CNY appreciation, carry traders did not forward hedge USDCNY. If they had hedged, the USDCNY forward premium would wipe out most of the profit. These carry traders profited off the PBOC who sold CNY and bought USD. The PBOC’s USD assets, mainly US treasuries, have much lower yields than comparable CNY debt. The easiest way to import USD into China was to fake invoices; this allowed individuals and corporate to FX more USD into CNY than allowed by the PBOC. The one way CNY appreciation is now over. The carry traders are rushing for the exits, and the PBOC has put up the road blocks. Banks are now enforcing the yearly $50,000 FX limit; overseas UnionPay withdrawals are limited to 100,000 CNY per year; money changers, who previously would help move CNY in and out of China, have been shut. With capital trapped onshore, the PBOC can now devalue the CNY without suffering a loss in China’s capital account. With the easy and cheap means of moving CNY out of China closed, Bitcoin presents a legal and viable option. 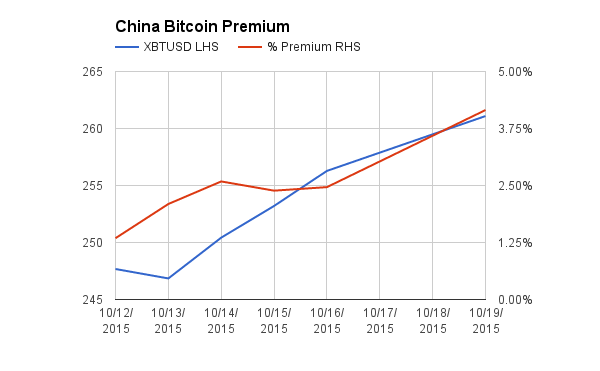 The premium of XBTCNY and XBTUSD has begun rising ever since the PBOC devalued the CNY by 4% in August. If this hot money leaks into Bitcoin, the premium and price will shoot higher. The top chart shows the XBTCNY premium vs. the PBOC Interbank Rate. 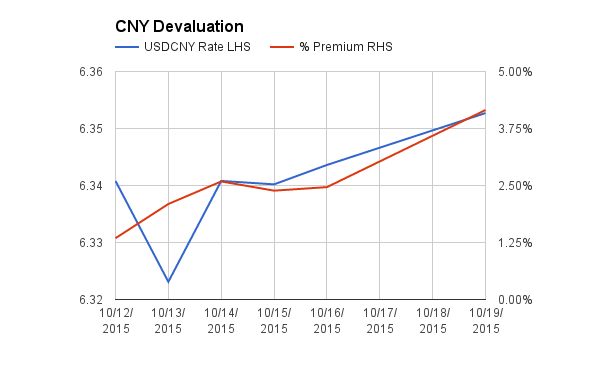 The premium rose as USDCNY moved higher (read: CNY devalued). The bottom chart shows the premium vs. Bitstamp XBTUSD. As the premium rose, XBTUSD rose as well. These are the most important charts in Bitcoin. China drove the 2013 Bitcoin bubble. The PBOC isn’t done yet. The CNY will weaken, and as it does Bitcoin will slowly leak higher. This process will happen either slowly or all at once. To take a longer term bullish view on the devaluation, consider buying the BitMEX March 2016 25x leveraged Bitcoin / USD futures contract, XBTH16. 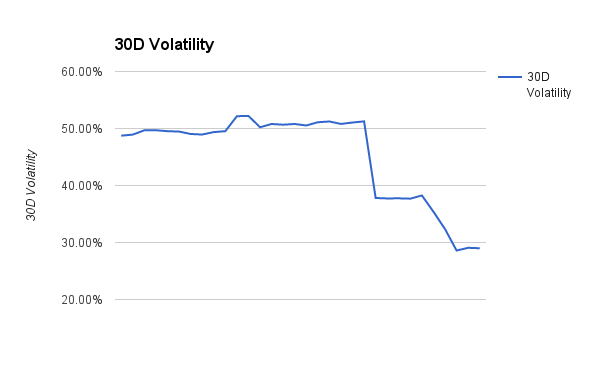 Volatility spiked over the weekend during the China pump and dump. As a result, the term structure parallel shifted upwards. All contracts became more expensive, with shorter dated contracts experiencing the greatest shift upwards. There is a liquidity premium for shorter dated contracts, and that is why they tend exhibit more basis volatility. The term structure has now become inverted. XBTH16 looks quite cheap in comparison to its peers. XBTH16’s basis only increased 9%. Given the time value this contract still retains, it should increase the most if the price volatility continues. 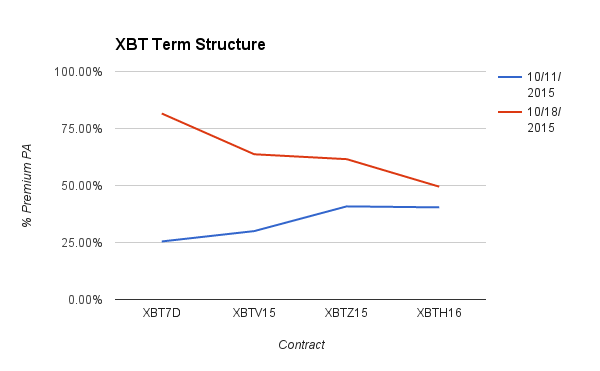 If the curve flattens, XBTH16 should trade at 60%, an increase of 10% annualised. 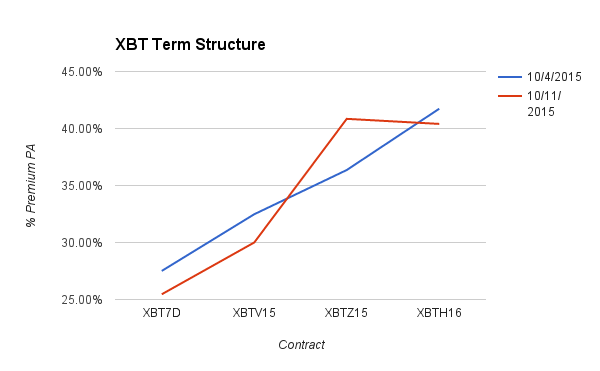 If the curve steepens, XBTH16 could trade at 70%, an increase of 20% annualised. Buy XBTH16 (March 2016) vs. sell XBTZ15 (December 2015) to bet on the annualised basis of XBTH16 rising. The stair step rally continued into last Friday’s settlement. Then Saturday early morning China time, a pump began. XBTCNY reached a high of 1835. At the pump’s peak, the premium in China was 10%. The price languished above 1800 CNY, then dumped late Sunday night to a low of 1706 CNY. The rally that started a few weeks back is not over. 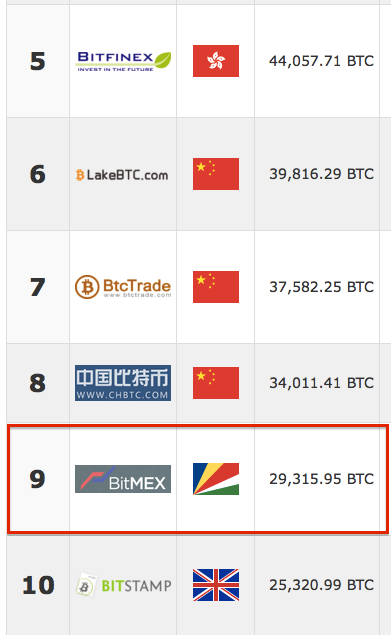 $260 held on Bitstamp, and China has remained above 1700 CNY. After the weekend fireworks, expect a period of consolidation between $260 to $265. A break below $260 on decent volume will put pause in the rally. If the price can hold above $270 for 24 hours, a run to $300 is likely. 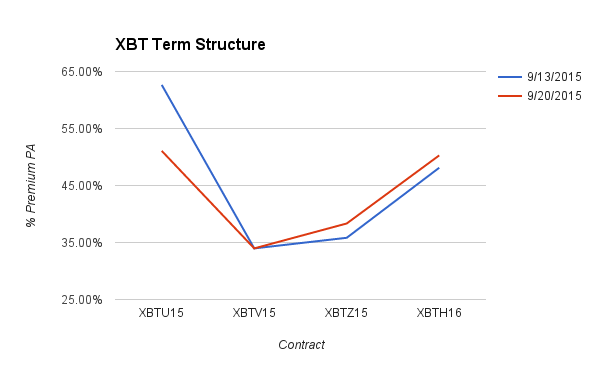 Buy October 2015 25x leveraged Bitcoin / USD futures contracts (XBTV15) while spot is $260 to $265. The upside target price is $270 and then $300. Due to the low price volatility, BitMEX has increased leverage on its daily (XBT24H) and weekly (XBT7D) Bitcoin / USD futures contracts. 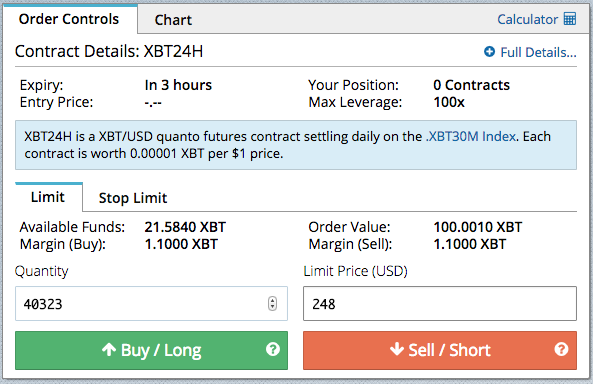 Traders can now use 100x leverage on XBT24H, and 50x leverage on XBT7D. Due to the tight trading ranges, traders employing scalping strategies should use these two contracts. Traders are not forced to use the maximum amount of leverage. If “Isolate Margin” is not enabled, the liquidation price will be calculated based on a trader’s total available equity with BitMEX. The last few weeks have witnessed the death of the cult of central banking. The investing narrative of the past 7 years was “central bankers can save the world economy”. With the ability to print unlimited money, there was no economic ill that couldn’t be cured. Investors who invested in risk assets were amply rewarded for their belief. The religion of central banking produced 0% interest rates and income inequality, and those who noticed the ills were regarded as Cassandras. Central bank policies since the outbreak of the crisis have made a crucial contribution to restoring the appearance of financial stability. 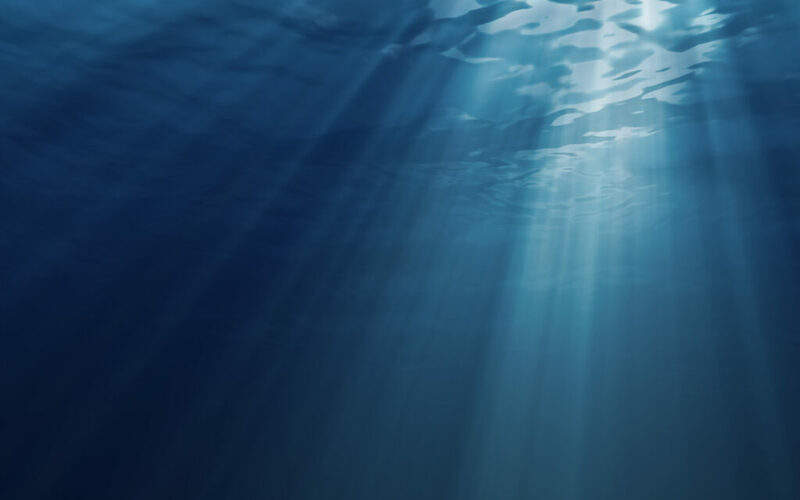 Nevertheless, for this appearance to become a reality, underlying problems rooted in very high debt levels must be resolved if global growth is to be more sustainably restored. Investors construct narratives as shortcuts to process the incomplete information they have about the future. 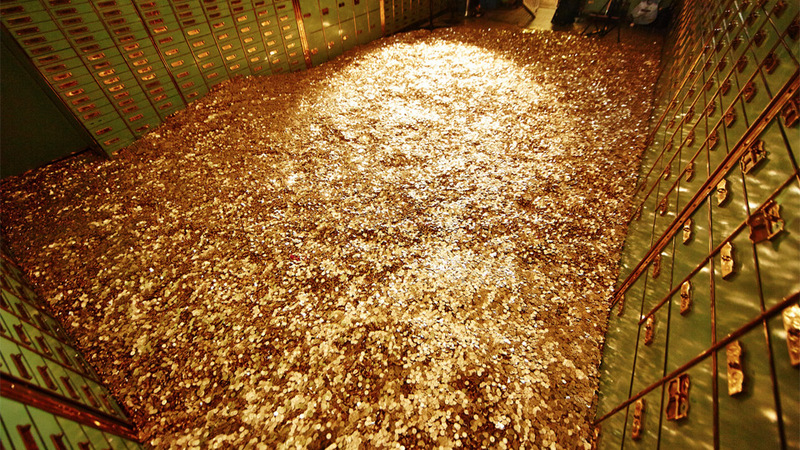 As the central bank omnipotence narrative wanes, investors might focus on cash flows again. The question used to be, which sectors will benefit the most from inflows of hot money. Whether or not a business can generate a net profit was of secondary concern. The question will now become, if free money is no longer effective in boosting asset prices, does this business produce a good or service that is actually desired by the market, and can they turn a profit. The most important question is what assets can one buy to express a negative view on the effectiveness of central banking. Gold traditionally has been the go to asset, and the new kid on the block is Bitcoin. The 2015 narrative for Bitcoin was “Bitcoin bad, blockchain good”. Banks and other financial institutions eschewed the word Bitcoin, and transformed into digital payments and blockchain companies. Bitcoin became the scarlet letter. The price and interest in the currency suffered as a result. The price fell 50%, and volatility remains at all time lows. 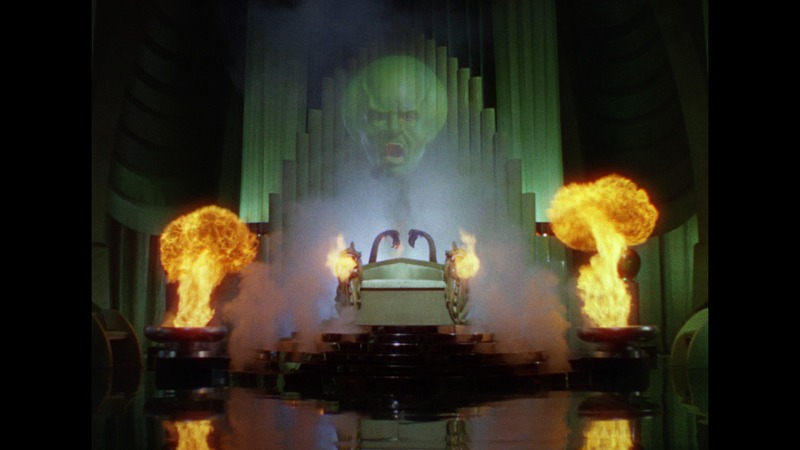 As it becomes popular again to bash central bankers’ attempts to control every variable of the global economy, Gold and Bitcoin will benefit as an expression of dissatisfaction with the high priests and priestesses. Now is the best time to increase exposure to assets that have fallen out of favour and price. Bitcoin will be fashionable again when the price exits its funk. Savvy traders who purchase Bitcoin derivatives now will see above average returns as premiums on the future value of Bitcoin rises as well as the price. Any product that has significant time value should be bought. For patient traders, BitMEX March 2016 futures are recommended. Between now and March we might get the first and last Federal Reserve rate hike, and/or a severe correction in the global financial markets. We are at the end of a 7 year bull market. Nothing moves in a straight line, or lasts forever. How Liquid Is Your Portfolio? A common refrain about Bitcoin from many institutional investors is its illiquidity. Bitcoin trades close to $100 million per day; this is very illiquid compared to G10 currency pairs. But what many forget is that in our centrally planned economic world, citizens are one government directive away from being unable to trade the assets in their portfolio. Turning to the biggest success and failure of 2015, the Chinese equity market, many investors are learning just how liquid this market is. The Chinese government began aggressively pushing anyone and everyone to trade the stock market. The aggressive policies helped the market more than double in one year. But as the market corrected almost 50%, the government barred many large traders and funds from selling securities. The CSRC has to date brought 41 cases of “market manipulation” (read: selling stocks) against various institutions. At certain points this year, the CSI300 futures contract was more liquid than Globex S&P Mini futures contract. And then the liquidity plummeted as the government began creating examples of traders attempting to realise profits or cut losses. Many in the west chided Chinese about their immature response to their stock market collapse. And many large investors have completely pulled out of China and will not return for some time. This is not just a Chinese phenomenon. Bans on short selling and long selling were used during the GFC just 7 years ago. These same countries that claim to be committed to capitalist principles, have all implemented policies with a similar spirit. If a market’s national government can effectively shut the market at a moment’s notice when it serves political ends, how liquid is your portfolio? Contrast this to Bitcoin, where there are a multitude of exchange operators. When MtGox went down, that wasn’t the end of Bitcoin trading. When Bitstamp got hacked and was offline for one week, people still exchanged Bitcoin in an orderly fashion. While the absolute liquidity is orders of magnitude less than other assets, at least Bitcoin can still be traded when the leading exchanges are shut down. Volatility continued to fall last week. XBT7D, XBTV15, and XBTH16’s basis all declined WoW. The drop in volatility is happening against a backdrop of a slowly building rally. If Bitcoin can break through $260, the surge of trading will lift the volatility out of its slump. XBTH16 has the most amount of time value remaining, therefore it has the greatest sensitivity to a move in basis. It is the most attractive contract to buy if one believes in a normalisation of volatility and a possible continuation of the rally. Buy XBTH16 vs. sell XBTV15 to profit from a rise in price volatility and interest rates. The slow ascent to $260 continues. Bitcoin / USD is now flirting with $250. There is formidable resistance at this level, but the underlying fundamentals of this rally are encouraging. Golden Week is now finished in China, and price action will increase. The next major known event is the Silk Road auction, which takes place in early November. Go long 50x leveraged weekly Bitcoin / USD futures (XBT7D) while spot is $245-$250. The upside target price is $260.